Pelican Water is your factory-direct source for the complete line of Pelican brand water purification products. From whole house water filters, salt-free water softeners, iron removal systems and complete well water systems, Pelican Water has your answer. As the official factory-direct website for Pelican Water Softeners and Pelican Water Filters, PelicanWater.com is on top of the newest technologies available today. 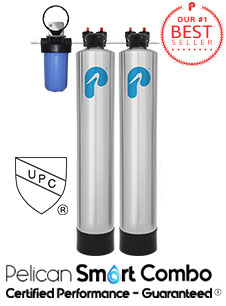 The Pelican Combo Series combines the benefits of the Pelican Carbon Series Whole House Water Filter along with the Pelican NaturSoft Salt Free Water Softener to give you better than bottled water quality from every tap. Start enjoying great tasting water, softer skin and hair all while stopping the negative effects of hard water scale build up in it tracks. Additionally the Pelican Combo Series requires virtually no maintenance and does not waste water or use any electricity.